Welcome to the second installment of PuzzleNation Book Reviews! Our book review post this time around features Eric Berlin’s novel The Puzzling World of Winston Breen. That name might look familiar. Yes, Eric and I are both contributors to the PuzzleNation blog. You may think that biases my review in some way, but I assure you it doesn’t. Yes, we both work on the same blog, but Eric stole my lunch money once, and I think that evens things out nicely. Remember: coworker + stolen lunch money = objectivity. Young Winston Breen is a puzzling fiend, and most everyone in his town knows his penchant for puzzles is unmatched. So when the box he buys his little sister for her birthday turns out to have a secret compartment with a puzzle inside, everyone assumes Winston is behind it. But he’s not, and worse yet, he can’t solve the puzzle at all. Winston and his chums start investigating where the puzzle came from, but after a curious encounter with the town librarian and crossing paths with a few shady characters, he soon discovers his puzzle is part of a much larger mystery: an actual treasure hunt. Can Winston, his pals, and these strange treasure hunters unravel a 25-year-old puzzle? More importantly, who can Winston trust? I’ve seen this book described elsewhere as The Da Vinci Code for younger readers, but honestly, I enjoyed this book a lot more than Dan Brown’s efforts. 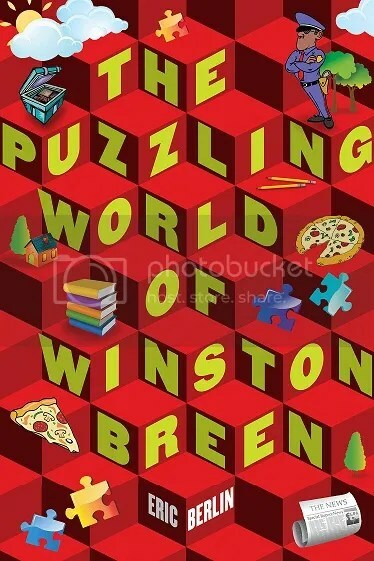 The Puzzling World of Winston Breen is not only a fun read and chock full of all sorts of puzzles — some central to the mystery, others as stand-alone little challenges — but it’s a delightful romp of a story. The voices of the younger characters all ring true, avoiding the common YA pitfall of having preternaturally sharp protagonists and supporting characters. Winston is often flummoxed by the challenges and obstacles he encounters, but he never gives up, always looking for another solution or pathway to solving whatever problem he faces. But I also appreciate the lingering sense of menace to the book’s central mystery. You never lose that feeling that there’s some potential danger involved. With break-ins, vague threats, and shady characters with their own agenda, that shadowy feeling doesn’t overwhelm the more carefree puzzle-solving fun of the book, but it does add some stakes to the treasure hunt itself, which I quite enjoyed. Well, I hope you enjoyed the latest installment of PuzzleNation Book Reviews, and I look forward to more book discussions in the future. In the meantime, keep calm, puzzle on, and I’ll catch you later. This entry was posted in Kids, Puzzles and tagged Book review, Geeking Out, Pop culture, Puzzlin' fool, Winston Breen by gmdirect. Bookmark the permalink.